An update to this blog posting, 8:30 April 4: Dora was picked up in Tompkins Square Park today, April 4, and returned to rehab at WINORR. 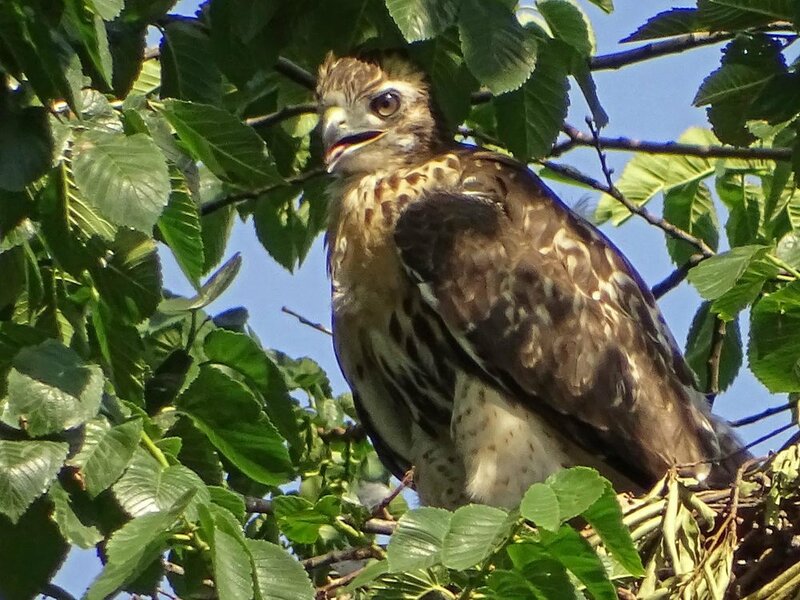 There is a possibility Christo already has a new female in the nest, for he was seen mating with another female hawk while Dora was in the car. There is concern that if Christo and the new female have eggs and bond over them, Dora will be forced out if she is returned to the park. 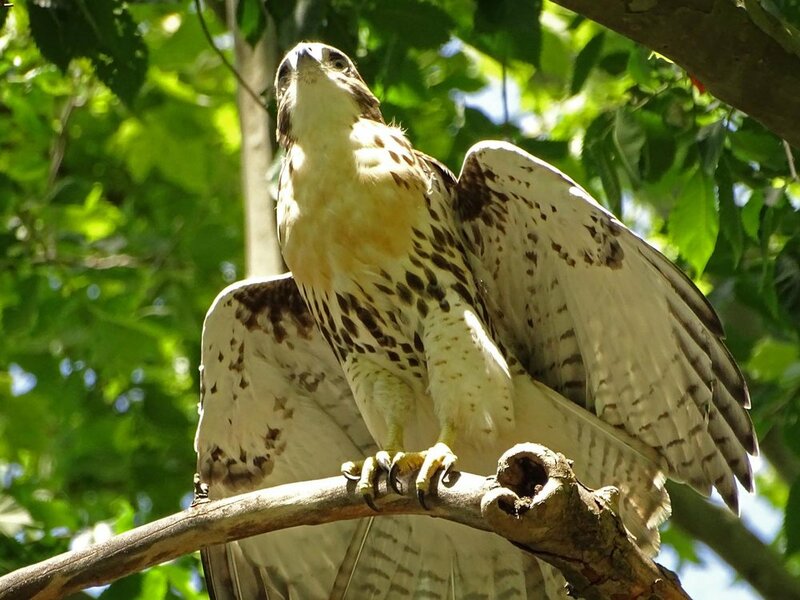 When Dora, the resident female red-tailed hawk in Tompkins Square Park, went to rehab at WINORR in November for a wing injury, Christo seemed a bit lost, not knowing where she was. He eventually took up with another adult female and was courting her and mating with her. Dora returned to the park after rehab at the end of February, and after a rocky start, she regained her nest and her mate, and they have been mating regularly and building the nest. For a fantastic history of the drama, see Laura Goggin's blog. I visited the park on March 24 to check out the pair, and then visited again on April 2. 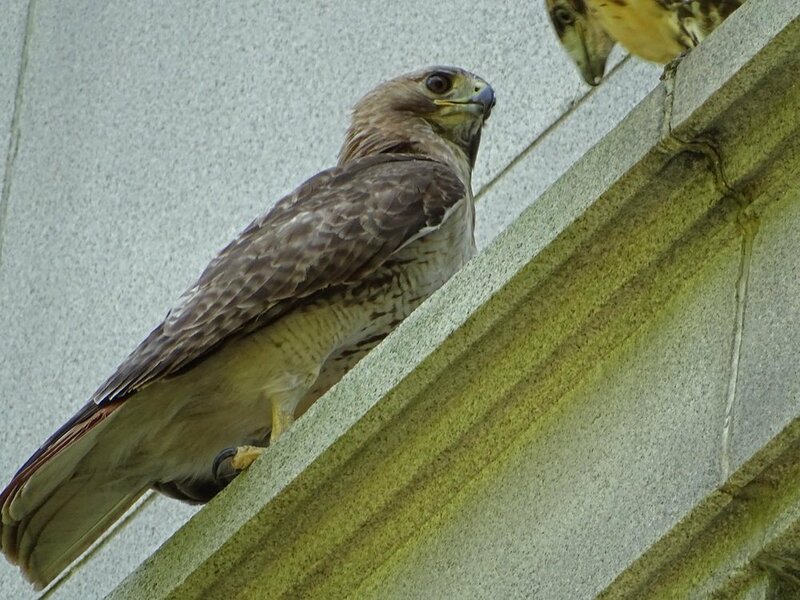 When we arrived on the 2nd, Dora had just been in a fight with another adult red-tailed hawk (apparently not the female Christo had been mating with, nor Christo himself, but a new hawk who had been in the nest). Dora won the fight, but seemed very shocky afterward. We saw her on a low branch near the dog run, and we watched as Christo came in to mate with her, and then as she flew in short bursts from tree to tree before going into the nest. She mated at least two more times, and Christo fed her. The Chasing the Hawks video shows the pair on March 24 and April 2. To skip to April 2 to see Dora and her behavior after the fight, go to minute 6:37. These photos were taken on March 24. Dora on April 2, showing her wonky wing. I've been chasing the red-tailed hawk babies at three spots in Manhattan so far this year: Central Park (Pale Male and Octavia have three kids this year), Grant's Tomb (there are three babies from that nest), and Tompkins Square Park (Dora and Christo have one baby, and are now fostering a second fledgling who was rescued in Brooklyn). In my first video of the offspring of the three nests, you get a chance to compare the kids. You'll note that the Tompkins Square kid is a bit younger (you'll get to see video of the new kid later). 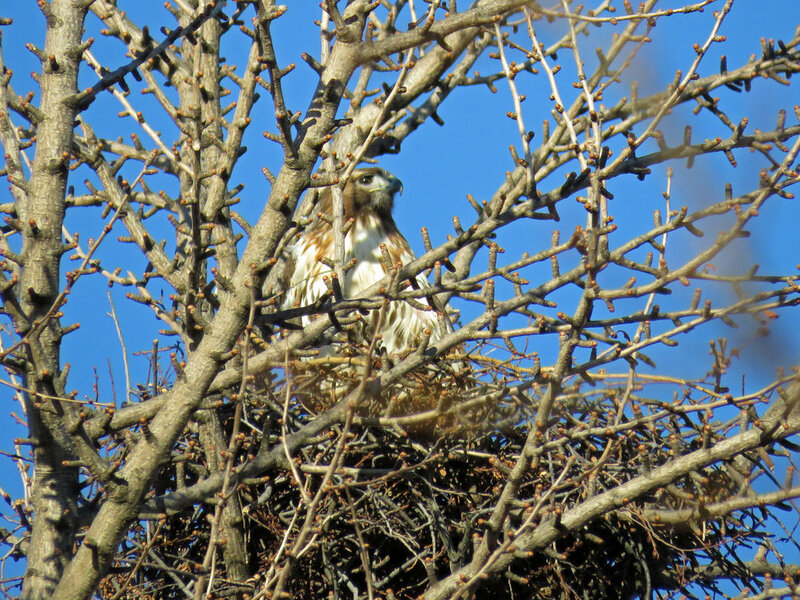 An offspring of Pale Male and Octavia in a tree next to Central Park on Fifth Avenue, June 9. A Grant's Tomb baby shows off the wings, June 11. The Tompkins Square Park kid, offspring of Dora and Christo, branching out, June 11. This first set of photos is of the Central Park babies. These photos are of the Grant's Tomb baby, plus Mom, when she brought in food for her kids. The Tompkins Square Park youngster, offspring of Christo and Dora. 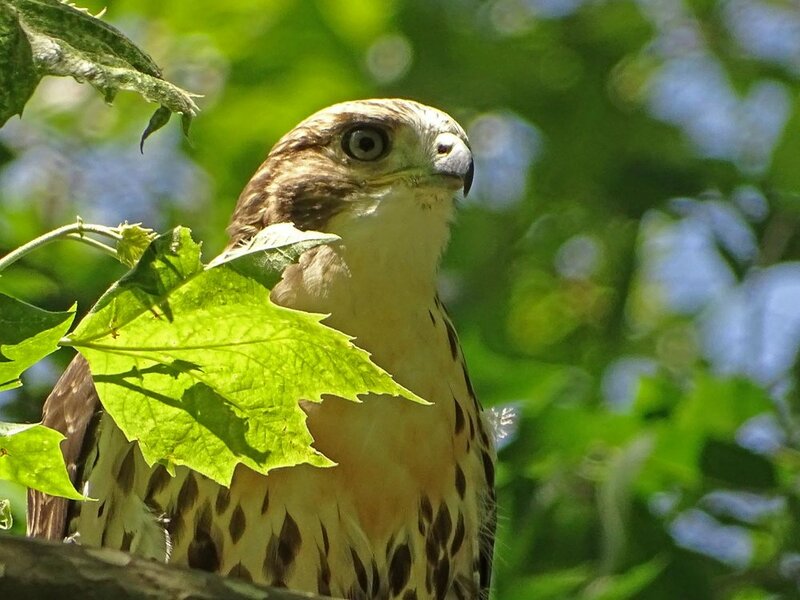 I've spent some time this spring with two pairs of hawks that have been sitting on eggs — Pale Male and Octavia in Central Park, whose nest is on Fifth Avenue, and Christo and Dora, the Tompkins Square Park pair who have nested this year above the park bathrooms. I put together Chasing the Hawks: Uptown Nest, Downtown Nest to celebrate these two sets of raptor parents from March 10 through April 18. It appears that both nests have now had hatchings. Pale Male has been handing out cigars for the past week. 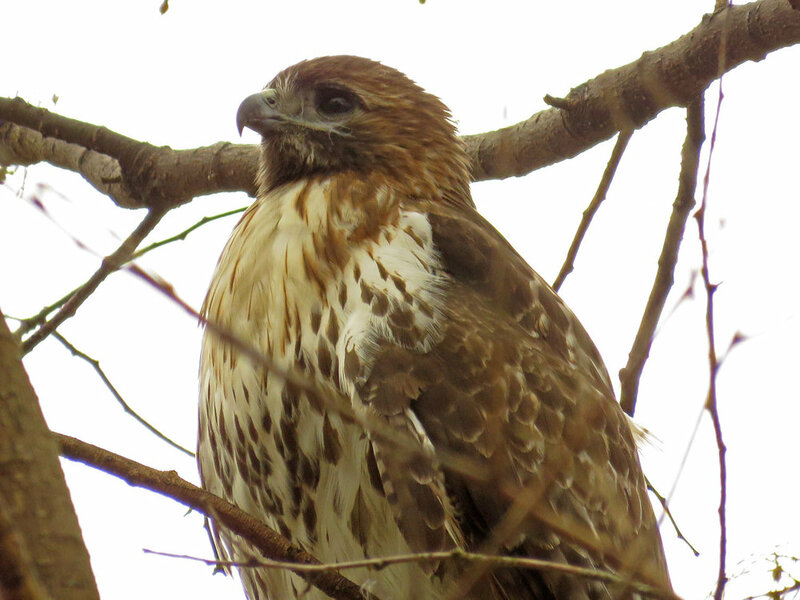 On March 19, a first-year red-tailed hawk was hanging out near the Boathouse in Central Park, within view of the Fifth Avenue nest. Pale Male didn't seem all that perturbed until the youngster flew closer to him, at which point Pale Male let the kid know who ruled that neighborhood. 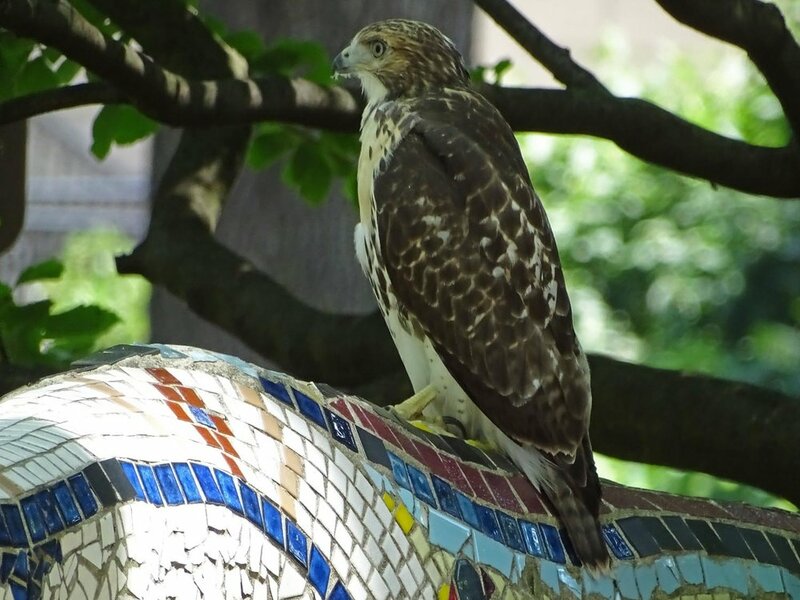 I visited the Tompkins Square hawks the afternoon of April 10. We saw both Dora and Christo on the nest, and the switchout when Dora returned to take over from Christo on the eggs. When we left the park as it was getting dark, Christo was perched on a tree eating a bird he had stored there at some earlier point. Pale Male was high on a treetop on Cedar Hill on April 14. He was standing regally on a pigeon for a while, ate part of it, then took the remainder to the nest. Octavia flew out with the remaining dinner to Cedar Hill, where she ate it on top of another tree. Two little white heads have been seen the Fifth Avenue nest, and it will be so exciting to watch the newest of Pale Male and Octavia's kids grow and fledge and learn to hunt this summer.